Our territory is in Lombardy next to the border with Switzerland and by the sides of the Lake of Como. The beautiful town of Tirano, where our cellars are, is simply reachable by train or by car from the Lake of Como and it is on the way to important touristic resorts as Saint Moritz, Bormio and Livigno. 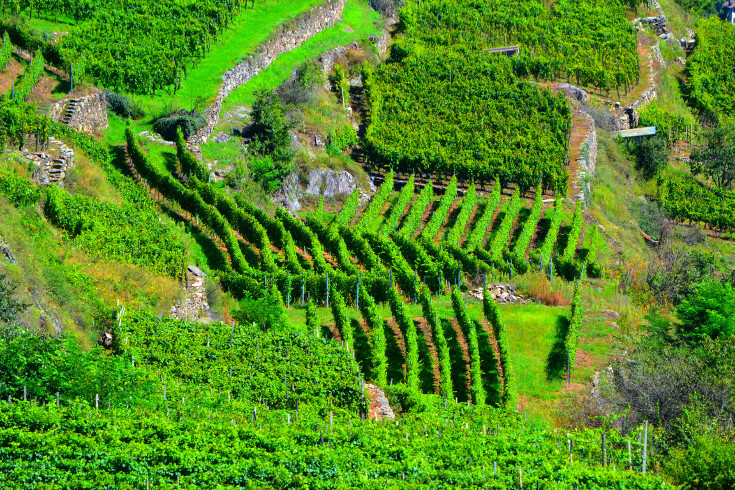 Our vineyards are at different altitudes in the areas of Sassella, Inferno, Valgella and in the surroundings of Tirano. To each Vine its own Wine. The cellars, the shop and the tasting area are situated in the old town center into the beautiful Torelli's Palace, a symbol of our land. Fascinating rooms where it is possible to taste and buy our wines and the old cellars where our products can refine. Just in the old town center of Tirano, along Torelli Street and Sant'Agostino Street, close to the City Hall, people can find Torelli's Palace. The Palace, that have been the recidence of Misasi's family, is the place where the Count Luigi Torelli has got borned and where he has died (1810-1887), important personality of the valley, who has been part of the historical Cinque Giornate in Milan and who later became Minister and Senator of the Italian Kingdom. Torelli's Palace has been built in the XVI century, it has an indoor court with a beautiful baroque portal and an elegant balcony. In all the halls it is possible to find frescos maybe painted by the Jesuit painter Giovan Battista Muttoni, all enriched with beautiful period furniture. The chapel and the sacristy, the both overlooked to the court, are valuable. The Palace has been ably restored and brought back to its old splendour thanks to the direct effort of the Torelli's Family. At the end of the street rises the Torelli's Tower, with fake medieval structures, built in the second half of the XIX century. wooden and vaulted ceilings and a beautiful room with a wine press.